For the enthusiastic entertainer, the plucky party planner, or the Host/ess with the mostess we've got a fantastic round up of gifts for anyone in your life that loves to throw a good dinner party and takes as much care with the tablescape as they do the food and drink. 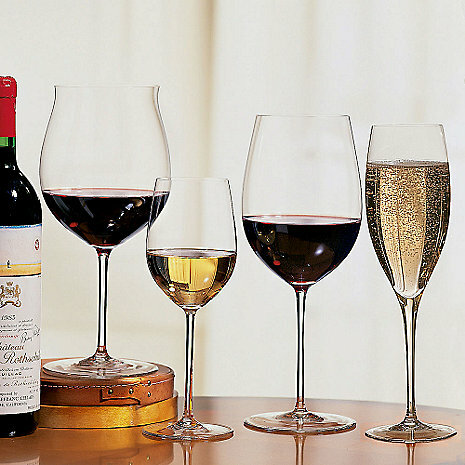 For the sommelier wanna-be in all of us, the Riedel Sommeliers Tasters Set ensures that you always have the right glass at hand whether it's a rich Bordeaux or a fresh Chenin Blanc. The Sunao flatware setting from Saikai is designed with nature and function in mind. The delicate curves soften the straightness of each piece, recalling a soft breeze or a ripple of water. Each slim and stretched form was designed to link the characteristics of forks and chopsticks, creating a symmetry between the different types of utensils. Perfect for the hip and playful entertainer, these triangle screen printed tea towels can be folded and used as cloth napkins. They are hand printed using eco-friendly ink and the fabric will only become softer the more you wash it. Adaptable to any style or use, the Teema Tableware collection designed by Kaj Franck for Iittala is based on the fundamental shapes of circle, square, triangle, and rectangle. From these enduring forms, the designer created a range of functional dishes for the home that can be used in myriad ways: from preparing the meal, heating and serving, to storing and freezing. These timeless and sophisticated pieces provide an essential form to allow the food, family, friends, and conversation to shine. With its Blue Pine interior and Stone White exterior, this Vegetable Bowl from Heath Ceramics is bright and festive—the perfect pop of color for any tablescape. This pair of large walnut serving spoons with arrow detail are hand carved from locally sourced walnut wood by Amelie Mancini in Brooklyn, New York. Each pair is one of a kind and oiled with beeswax and mineral oil for a super smooth finish. We love the simple, beautiful work of Portland based ceramicist Lisa Jones of Pigeon Toe. This hearty porcelain butter dish is enhanced by a square bronze handle giving it a modern but timeless elegance. The six-cup espresso coffee maker that started it all, Alessi's 9090 was the first object for the home in the company’s history, as well as its first product to be inducted into the Permanent Design Collection at New York’s Museum of Modern Art. It was also the Italian brand’s first "amphibious object": a tool for the kitchen so beautifully designed that it is equally welcome at the table. Crafted in 18/10 stainless steel with a cast iron handle. Made in Italy. Designed by Fredrick Arndt in eco-friendly American black walnut, this trivet is right up our ally. We love the variation in the wood grain pattern and the sleek and structured design. It's a perfect bit of modernity for the table. You must of course offer coffee at the end of a triumphant meal. These blue and white geometrically patterned enamelware mugs in a modern Welsh design are perfect for just that or any old time a hot beverage would hit the spot. For presenting sugar and cream on the table we suggest this minimalist, hand-thrown sugar bowl and creamer set from Pigeon Toe. We especially love the small leather loop handle on the sugar bowl lid.